Once we left Glacier, we headed through Montana and Idaho towards Seattle, Washington. We spent one night on the road in Ritzville, Montana at a pleasant, but unremarkable Best Western. The next day, we rolled into Seattle for two nights. We had two busy days in Seattle. We first visited the city center and had our first look at the Space Needle. Although no longer the tallest building in Seattle, it is still iconic. Near by is the EMP Museum, dedicated to Science Fiction, Music and Popular Culture. Designed by Frank Gehry and paid for by Paul Allen, it's also iconic. We took the monorail into the center of Seattle, where we caught a glimpse of the waterfront area. The next day, we headed out for a tour of the Boeing Plant just outside Seattle (Everett) where they make some of their aircraft. They don't allow photographs inside the plant, so there aren't any pictures of the actual construction process. This is the largest building in the world. We did get to see a "Dreamlifter" taking off. The Dreamlifter is a heavily modified ( and very ugly ) 747 used for hauling aircraft componenst (like complete wings) from one location to another. There is a display area inside the Visitors Center, but it's not terribly well done. Then on to downtown Seattle again - this time to take a ferry to see the waterfront from the Puget Sound and just to get out on the water. Not our ferry, but one just like it ! After the ferry ride, we took The Underground Tour. Bill Speidel was a journalist who in the 1960's wanted Seattle to preserve it's history and used the Underground Tour as a way of showing locals what they might lose. "The Underground" is actually a series of passages and cellars which were originally at ground level. After a severe fire and floods at the turn of the 20th century, the city raised ground level by 15', leaving these spaces "underground"
An original "Crapper Toilet". These were supposed to cure Seattle's chronic sewage problem, but failed because the sewage system was totally inadequate and the sewage would flow backwards at high tide. On the right,the original ground level walls of the building above.On the left, the walls built by the city when they raised the roads. The space in between was originally used as a sidewalk, but after it was covered over, it became storage. You might think these spaces would be smelly and damp, but they are actually well ventilated and quite comfortable. On our last day in Seattle, before leaving we DID take the elevator to the top of the Space Needle, just so we could say we had done it. We didn't spend long at the top of the Space Needle, but at the base was a permanent exhibition of the work of Dale Chilhuly (who comes from Tacoma) which was spectacular. A columnic sculpture, influenced by the sea and the creatures which live in it. Somtimes hard to tell the real flowers from the glass ones! 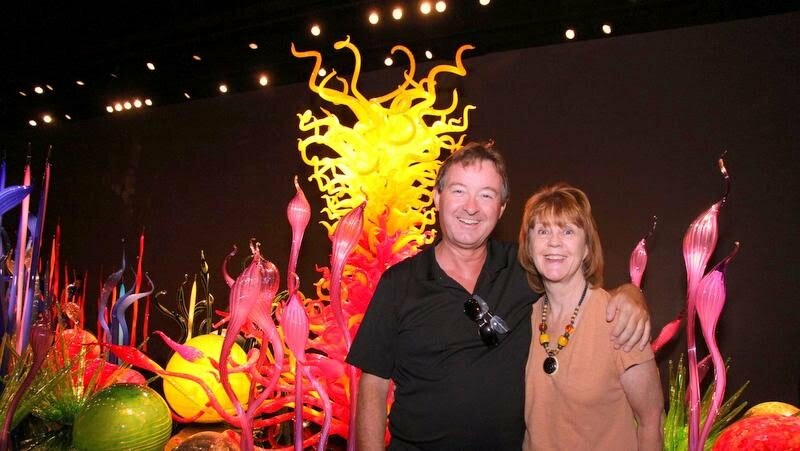 One last image of a Chihuly "tree" with the Space Needle behind! And with those glowing images still stuck behind our eyes, we left Seattle and headed for Portland. In Portland, we stayed with an old friend from Orlando, Deborah and her husband John. They live in a renovated craftsman cottage in the north of Portland. So we stayed for three nights in "The Knotty Grotto". The first day, we met an old friend, Laurie, who happened to be staying in Portland and had lunch at "Pine Street Biscuits". Southern Cooking in the Northwest. After lunch, we headed out to see the Columbia Gorge. As you drive along The Gorge, there are a series of waterfalls, all very high - some more spectacular than others. The second day, we went into Portland (by bus, no less) and after spending time in Powell Books, the biggest book store in the world, went to lunch with Kyle, Deborah's eldest daughter. We then spent a couple of hours walking around Portland, getting to know our way around, before heading home. Next day, we said our farewells early and left Deborah to get ready for her next Airbnb guest, who was arriving the same day. Once we left Portland, we actually crossed back into Washington and then headed North to start driving the Oregon Coast from the extreme North. As it turned out, our first stop was at Fort Clatsop where Lewis and Clark spent the second winter of their historic exploration of the American West. It's now a National Park site and the fort has been reconstructed. The next day, we continued on down the coast, which consisted of a series of large, wide beaches, rocky headlands and in places, large bridges across the various rivers and streams coming down to the Pacific. Our last stop was at the Oregon National Dunes Recreation area, a long area of very high sand dunes which seperate the sea from the inland areas. We drove down the Oregon Coast from Coos Bay to Crescent City, stopping at interesting places as we went. A nice day at the beach, although too cold for anything except sighseeing and walking. Natural Arches formed by the waves, known as "The Three Bridges"
Next day, we continued down the California Coast, passing through the Redwoods Forest National Park. The majesty and beauty of these trees is very hard to capture on film, because they are so large. Our car and Kristine in the bottom corner give some of scale for these huge trees. These were not the largest trees we saw, but again this gives some sort of scale. Here, Kris stands in front of the knarled roots of an old, but still living tree. In some of the groves, the branches of the smaller trees create a wonderful twisted sculpture, almost seeming to be alive. After leaving Redwood National Park, we drove East to Redding for the night. Not much to see in Redding but we did find a large Walmart, so we did get our shopping done. The next day was overcast and cloudy and later in the day, it rained, but we detoured to Lassen Volcanic National Park on our way to Reno. The park was created after a volcano erupted in 1914 and 1915 and the main features are all volcanic, but due to the poor weather, we couldn't really see them. However, it was atmospheric. And a glimpse of the active thermal features here. Not on the same scale as Yellowstone, but interesting because they are all so new. After leaving Lassen NP, we drove to Reno, where we spent the night. Unfortunately, we had a little problem with the camera (no memory card) and we don't have any pictures of Reno. After Reno, we drove to South Lake Tahoe. We took the long way round, so we saw most of the lake. The next day, we drove to Bodie, which is a genuine Ghost Town, now preserved by the State of California. It was a gold rush town and while the gold lasted, it was a boom town. It's located high up in the Sierras (over 8,000ft) so it gets very cold in the winter. Although many of the buildings burned down in the last century, there are still many important structures remaining. Just needs a little dusting ! The last working mine is still visible on the hillside, although it's closed to visitors. Near the parking lot are various items of mine equipment, which have a stark and poignant beauty. And in the distance, always the mountains as the road from Bodie winds it's way down to the valley below.